Toby and I have both been interested in trying out metal working for a while now. I have always wanted to make my own jewelry and Toby likes the idea of making our own tools. 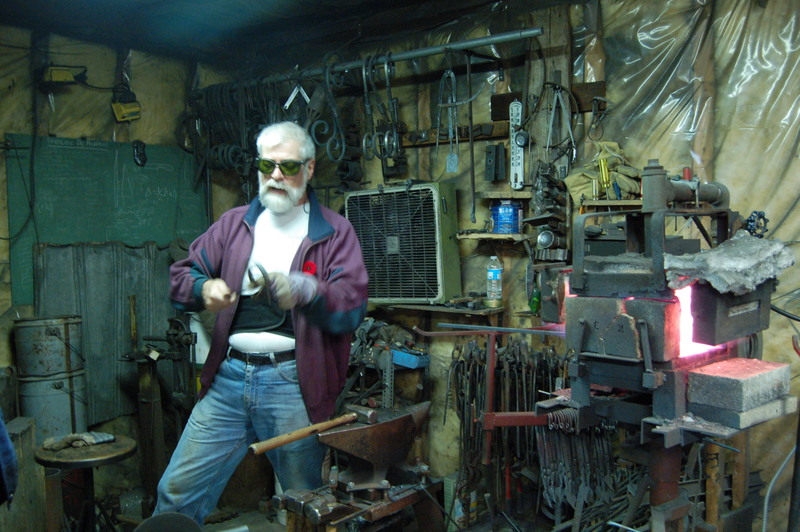 So this year for his birthday I booked us a weekend introduction to black smithing course with David Robertson at Ontario Artist Blacksmith. 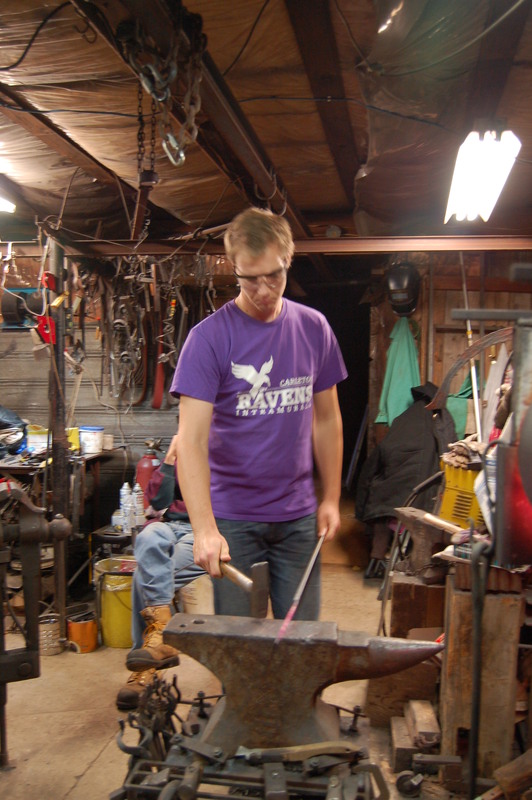 We cover safety, introduction to tools large and small, proper hammer technique, and the first project of a Tool Hook. Techniques: drawing out, curling, notching, curving, hot cutting. Consists of a series of projects with techniques building upon each other. Projects include Coal Rake, Coat Hook, Leaf Hook, Finials, and Tongs. 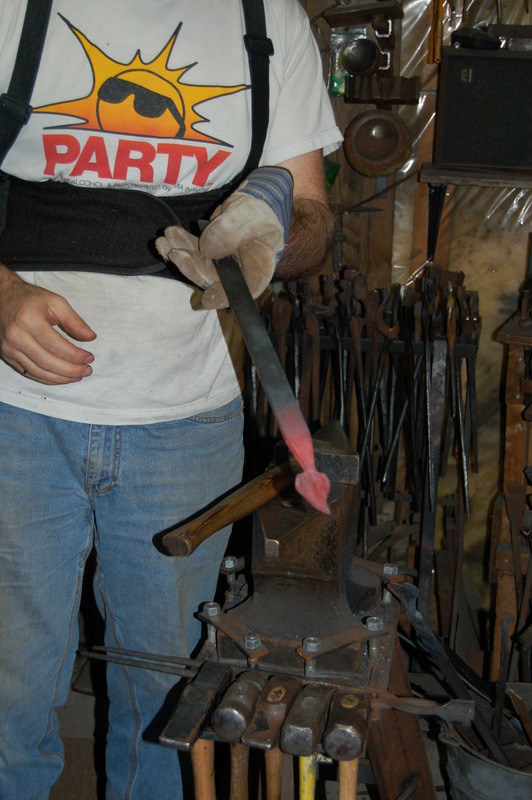 Techniques include: Pointing, Flattening, Shepherd’s Crook, Hot Reverse Twisting, Pointing Flat Bar, Spade Point, Pattern Punching, Offsetting , Shouldering, Through Punching, Leaves, Rattail. 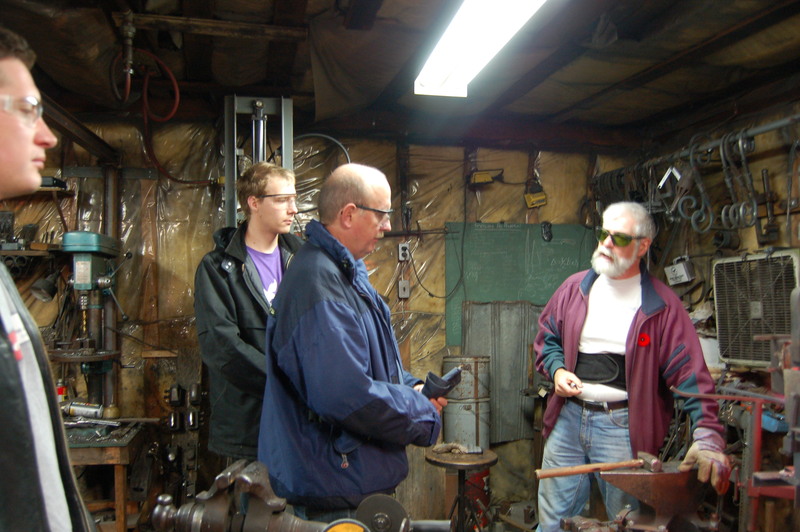 Starts with a discussion of alloy steels and follows with making a Cold Chisel from high carbon steel, Finishing Tongs, Discussion of Forge Welding, Discuss Setting up a Personal Workshop, Several Hours are set aside for working on a Personal Project. We drove up early on Friday and made it just in time for our first lesson. David started off explaining the safety precautions that must be taken when working in the shop. 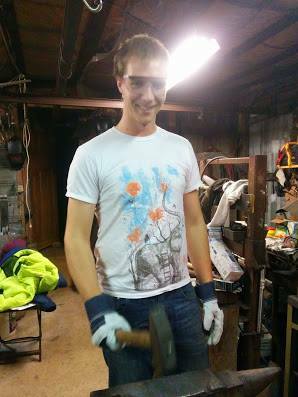 After that, he went over all the basic tools: hammer, tongs, forge, air hammer, anvil and various other useful things to have in the shop. When David was finished the talk we jumped straight in and started working with the metal. He demonstrated the first step of forming a small wall hook and we immediately followed suit. This was the flow of the weekend, he would show us one or two steps and we would continue on our own. We made each made 2 wall hooks, a decorative wall hook with a leaf, a fire poker, tongs, a chisel, a center punch and a personal project. I found that I could either hit the metal hard enough to move it or hit it where I wanted to. The choice was between power and precision.. and you really need both. By the end of the weekend I had settled into a good rhythm and was finding the work much easier. 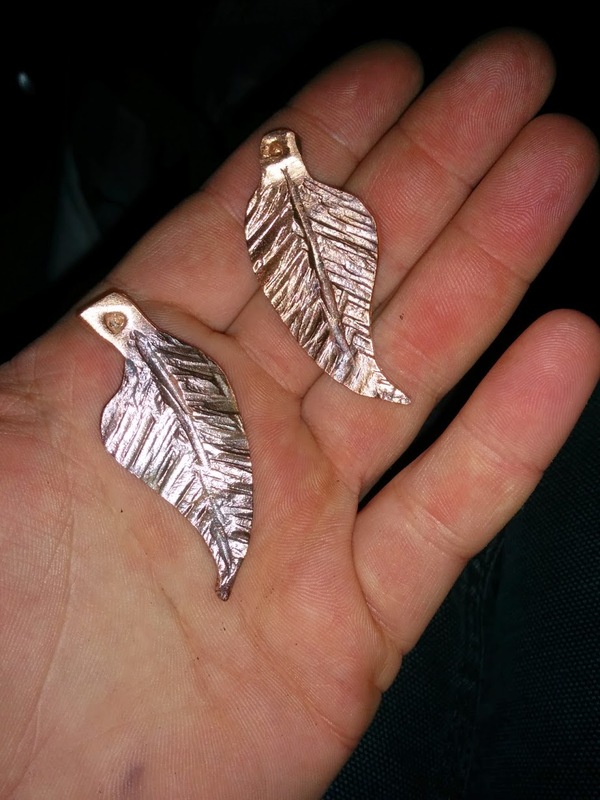 For my personal project I decided to make a pair of copper, leaf shaped earrings. It was soooooo much easier for me to work with the softer metal, I could shape it any way I wanted to. 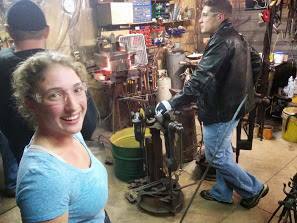 We learned all sorts of neat things through out the weekend, including all the basic black smith skills. 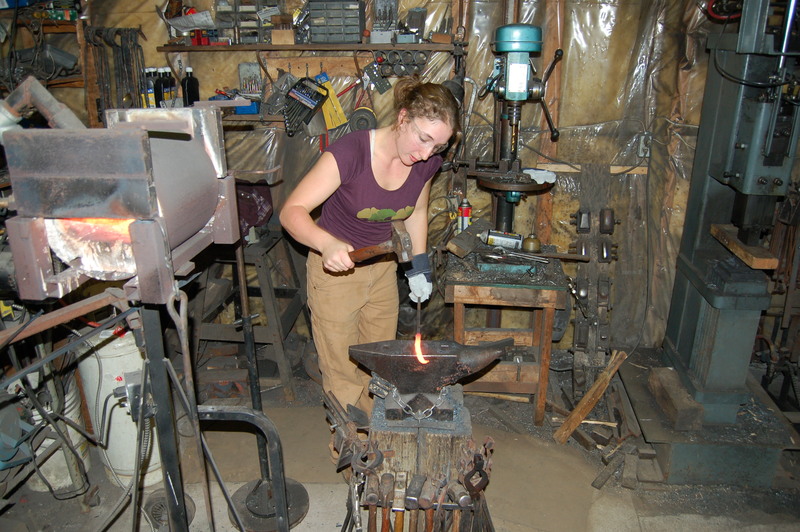 We practiced many times and discovered that working with metal is unbelievably approachable and a whole lot of fun. I don’t think I can adequately put the experience into words but I highly recommend that you give it a try if the opportunity presents itself. Toby and I will most definitely be building a forge at the farm.